Another September has arrived, and yet another season of BarCamp has started to unfold. On the previous Tuesday, the first edition of the new season was held! It comprised of a set of interesting speeches and intriguing stories on how three specific festivals are organized in Kosovo. The audience consisted of zealous people, both old and first-time attendants of BarCamp, eager to learn more. Few of us resisted the temptation to attend the largest film festival in Kosovo, DokuFest, this year. Many are those who have visited Peja to enjoy the only animation festival in the country. Meanwhile, Prishtina was a focal point for many classical musicians who gave breathtaking interpretations in front of the audience of Prishtina. While we have enjoyed the pleasure that these festivals bring, rarely have we thought about the necessary energy to bring forth these results. Therefore, this edition offered discussion on what is required to host a successful festival in our country, what values of Kosovo they promote and what values they bring. 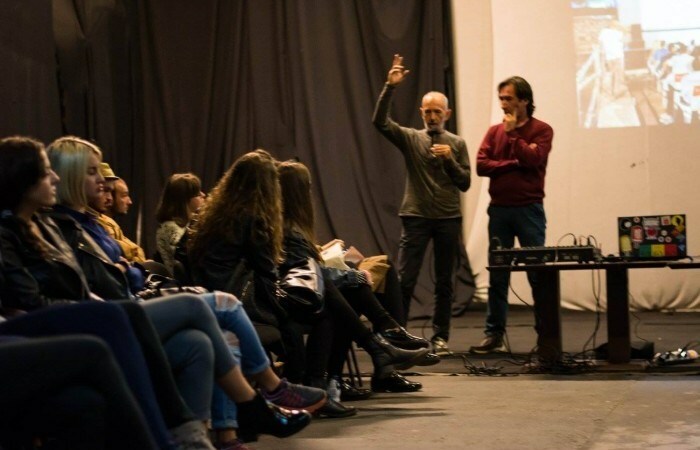 The thirty-first edition of BarCamp Prishtina brought four speakers, consisting of Eroll Bilibani and Veton Nurkollari, Rron Bajri, and Rafet Rudi, with groundbreaking stories about three different festivals: DokuFest, Anibar, and ReMusica. As usual, BarCamp tried to instill innovation and inspire the audience by offering them inspiring stories and generating debates in regards to any topic. This edition of BarCamp took place at the Oda Theatre as well, an area that provided a decent environment, where the participants could gather, socialize, listen to speeches, and share ideas. Each talk and discussion ensured that the participants’ minds remained engaged, while free fresh drinks kept the former receptive to ideas and thrilling discussions. Eroll Bilibani, the Executive Director of the International Documentary and Short Film Festival DokuFest, and Veton Nurkollari, the Artistic Director of DokuFest, shared the unique story behind the biggest festival in Kosovo. “It all started in a time when we were eager to change the situation in our city. We were witnessing a time when nothing was happening in Prizren. We wanted to give life to Kino Lumbardhi because no one was visiting it. We spent our lives in that cinema and it was devastating to see it dying” said Veton while emotionally continuing his story of the festival’s hard beginning. “All it takes to do something as big as Dokufest is to believe in what you are doing and find at least four other people with whom you share the same passion and determination.” Adding to the story started by Veton, Eroll continued the narration by expressing his deepest believe in the strongest pillar of the festival. “Volunteers, who are the spirit of the festival, are our pride and joy. They are a very valuable part of Dokufest and we cannot imagine doing the festival without them. Once they volunteer, they become part of our success story, they become part of the pride,” he said. Though a common stimulus on starting a festival might suggest a similar history, Anibar Animation Festival comprises a different success story. Brought to BarCamp in a unique animation style by Rron Bajri, the Artistic Director of the Festival, the history of Anibar has tempered the curiosity of the participants at the Oda Theatre. “We had no clue on what it takes to do a festival. We were young and we did not even have the rights to establish an NGO, which is the starting point of fulfilling the bureaucracies needed to organize a festival,” Rron said. Two young boys from Peja, who were eager to change their city, started their journey with only a few euros in their accounts but with a great desire to accomplish their mission. This year, Anibar was held for the sixth time in Peja which now is the center where international artists, creators, and youngsters meet. This BarCamp’s participants were eager to listen to inspiring stories and share their own thoughts in different issues raised. The audience was very interactive, while one member of the audience expressed his idea to organize a TEDx event focused on Youth. He invited other members of the audience to join him and, as a result, four individuals expressed their desire to join the TEDx organizing team after the BarCamp. BarCamp continues to be the focal point where people with ideas meet. Until next time, may the force be with you.